RHD is caused by a type of calicivirus, and is highly contagious among rabbits. It is not known to cause disease in any other species. In affected rabbits, it can cause sudden death, with some showing symptoms such as lethargy, fever, respiratory distress and bleeding. The disease can spread via direct contact with infected rabbits, from contaminated materials (such as food, faeces, clothing) and from insects and wildlife carrying infectious material. The vaccine for this disease is not readily available in Canada, and while indoor pets are considered to be at relatively low risk, good hygiene is recommended to limit the potential exposure to this virus. 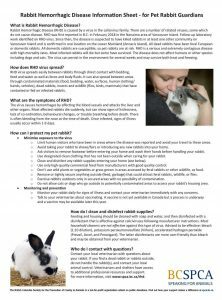 The following link provides a useful guide for rabbit owners to keep their homes clean and reduce the risk of disease. We will keep you updated on any further information that becomes available regarding RHD in this area, and encourage you to bring your rabbits in if you have any health concerns in the meantime.